The Oscars. Dresses. Glamour. HAIR. So who did we love? Sandra Bullock: The Golden Girl. Beautiful, sleek, glossy brunette hair. She looked perfect, and she won! Does not really get any better for her. Sarah Jessica Parker: The Risk Taker. Say what you will about her dress, but I loved her hair. The huge hairpiece is so dramatic, and you got to give her props for not being boring. I would have smoothed the front a little, but maybe it was windy! 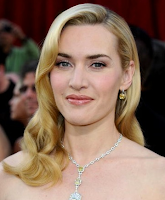 Kate Winslet and Cameron Diaz: The Old-Hollywood Glamour Girls. Long, blonde, cascading waves over one shoulder. It's a Hollywood classic, and both of these gorgeous women worked it beautifully. Meryl Streep: The Class Act. She just gets better and better. Her simple french roll accentuates her beautiful face. She is just impeccable. The Oscars are never usually the place for crazy styles, but these looks were classic, beautiful and effective.